TOYOTA CERTIFIED PRE-OWNED! WELL MAINTAINED! THIRD-ROW SEATING! NAVIGATION! POWER AND HEATED FRONT SEATS! LEATHER INTERIOR! PERFECT ONE-OWNER CARFAX! INCLUDES: 3rd row seats: split-bench, 6 Speakers, ABS brakes, Active Cruise Control, Alloy wheels, AM/FM radio: SiriusXM, Auto-dimming Rear-View mirror, Automatic temperature control, Blind spot sensor: Blind Spot Monitor (BSM) warning, CD player, Electronic Stability Control, Exterior Parking Camera Rear, Front dual zone A/C, Front fog lights, Fully automatic headlights, Garage door transmitter, Heated door mirrors, Heated front seats, Illuminated entry, Leather Seat Trim, Low tire pressure warning, Navigation System, Outside temperature display, Panic alarm, Power door mirrors, Power driver seat, Power Liftgate, Power moonroof, Power passenger seat, Power windows, Radio: Entune Premium Audio w/Nav & App Suite, Rear air conditioning, Rear window defroster, Rear window wiper, Remote keyless entry, Security system, Steering wheel mounted audio controls, Sun blinds, Traction control, Turn signal indicator mirrors, Variably intermittent wipers, and more! 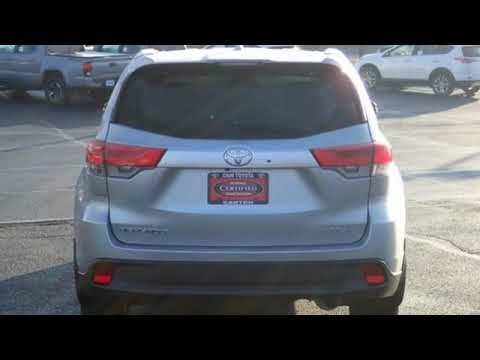 Contact Cain Toyota North Canton Ohio (330) 494-8855 for more information!brbrThis Highlander has just been Toyota Certified and now has warranty good until 12/21/2023 or 100,000 miles.brbrToyota Certified Used Vehicles Details:brbr * 160 Point Inspectionbr * Vehicle Historybr * Powertrain Limited Warranty: 84 Month/100,000 Mile (whichever comes first) from original in-service datebr * Transferable Warrantybr * Roadside Assistance for 1 Yearbr * Limited Warranty: 12 Month/12,000 Mile (whichever comes first) from certified purchase datebr * Roadside Assistancebr * Warranty Deductible: brbrAwards:br * 2017 KBB.com 12 Best Family Cars * 2017 KBB.com 10 Most Awarded Brands * 2017 KBB.com Best Resale Value AwardsbrbrWe sell vehicles in present day. We know our customers are very busy so that’s why we price every Pre-Owned vehicle with our best bottom line price. Aggressive pricing and great customer service is the Cain difference. The equipment, packages and color descriptions are derived by a second party Vin# decoder. Cain is not responsible for any wrong information. If traveling please verify all information before arriving to take delivery, or having a vehicle transported to you. For over 30 years Cain Motors has been satisfying customers in Ohio and other parts of the country. We know that you have many choices in dealerships and we realize your time is valuable. We would appreciate an opportunity to talk to you. We will listen to you and be attentive to your needs. Buying a new or used vehicle is more than a transaction to us. It’s a relationship. We want you to become part of our growing family of happy, satisfied customers. We’ll go that extra mile to make your experience at Cain Toyota-Scion a pleasant one! That’s not just a promise that’s a commitment! Browse our new or used GMC inventory and request a quote.Once we've found the perfect vehicle for you, we have financing options available that our staff will be more than happy to go over with you. Take the drive up to Dover and see why Millersburg, Cambridge, OH and Canton GMC customers choose us first when considering a new or pre-owned automobile. Cain Toyota offers a wide selection of 104 used and pre-owned cars, trucks and SUVs. We'll find the used vehicle you need at a price you can afford. Save $4,873 on a used Toyota FJ Cruiser near you. Search over 1,500 listings to find the best Cleveland, OH deals. We analyze millions of used cars daily. Huebner Chevrolet is your Carrollton Chevy dealer, selling new and used vehicles, along with certified service and parts. We take pride in serving our Louisville, Alliance & Salem Chevrolet customers. Visit us today! Welcome to Cain Toyota, your local dealership serving drivers in and around Massillon, Akron, Green, Hartville, New Philadelphia, and Canton. We pride ourselves not only in our vast vehicle selection and professional, efficient automotive service, but also our commitment to our customers. Spitzer Chevy North Canton is a Chevrolet dealer near Akron and Canton with Chevrolet sales and online cars. We also offer auto leasing, car financing, auto repair service, and Chevrolet parts accessories. Spitzer Automotive has various new & used car dealerships perfect for drivers in the Cleveland, Pittsburgh, and Homestead areas. Here at Spitzer Automotive, we offer many new vehicles across our Northern Ohio and Western Pennsylvania dealerships from leading brands like Chevrolet, Acura, Ford, Dodge, Chrysler, Ram, Kia, Mitsubishi, Volkswagen, and Jeep.